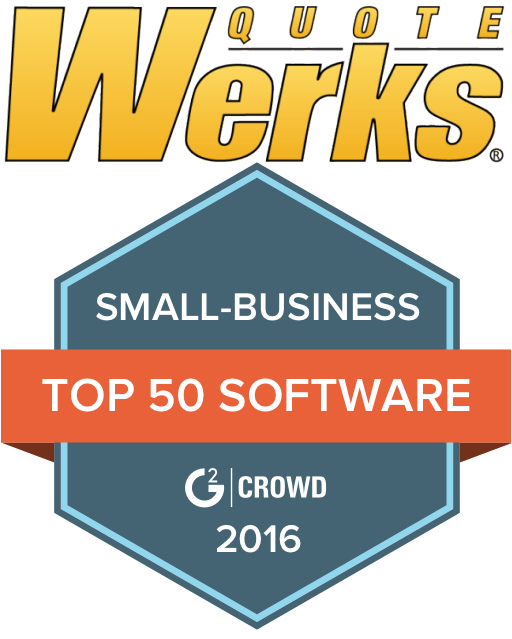 QuoteWerks clearly stood out among small-business users; reviewers rated them with high levels of satisfaction placing them among the top 10 products on "Top 50 Small-Business Software Products"
QuoteWerks was ranked as number 7 on G2 Crowd's List and the only CPQ and Proposal solution. G2 Crowd's Top 50 Small-Business Software Products list showcases the software that small-business users have rated highly, based on customer satisfaction score. Customer satisfaction scores were determined based on reviewers' likeliness to recommend the product to a friend or colleague. The small-business segment is defined as users at companies with 50 or fewer employees. The list is based on reviews received from August 1, 2015, through July 31, 2016. Orlando, FL, (PRWEB) August 18, 2016 — Aspire Technologies, Inc., the market leading provider of sales quoting and proposal software solutions, announced today that they were listed in G2 Crowd's Top 50 Small-Business Software Products. "QuoteWerks clearly stood out among small-business users; reviewers rated them with high levels of satisfaction placing them among the top 10 products on "Top 50 Small-Business Software Products", said Marty Duffy, Director of Research at G2 Crowd. "QuoteWerks strives to meet the changing needs and expectations of our customers and prospects," said Brian Laufer, Vice President of Aspire Technologies, Inc. "QuoteWerks is built on the feedback that we receive from our customers. It is an honor to be the only CPQ and Proposal solution to make G2 Crowd's List." In addition to this latest ranking, QuoteWerks is also ranked as a High Performer in the G2 Crowd Grid for CPQ Software. The G2 Grid rates products based on the CPQ products customer satisfaction and market presence. This has been an award winning year for QuoteWerks. In addition to this recognition, QuoteWerks was awarded as the Best Quoting Solution by the readers of ChannelPro-SMB and as one of two solutions honored as Best Managed Services Tool by Business Solutions Magazine in January. QuoteWerks has also won "Best Partner Involvement" at four ASCII IT SMB Success Summit events this year.